This morning, Jeff and I checked out of the Hotel Stella in Port Douglas. Our hotel transfer drove us along the scenic and winding northern Queensland coast back to Cairns. The tropical and rugged Queensland coast looks a bit like the northern coast of Maui winding under a canopy of palm trees. Likewise, this is one of the most beautiful drives in the world! Back in Cairns, we checked into our hotel, the Cairns Hilton. Then our transfer picked us up to take us to an aerial gondola near town called the Skyrail. We are in a tropical region, so this wasn’t a ski gondola to the ski slopes! However, this was thrilling, nonetheless. 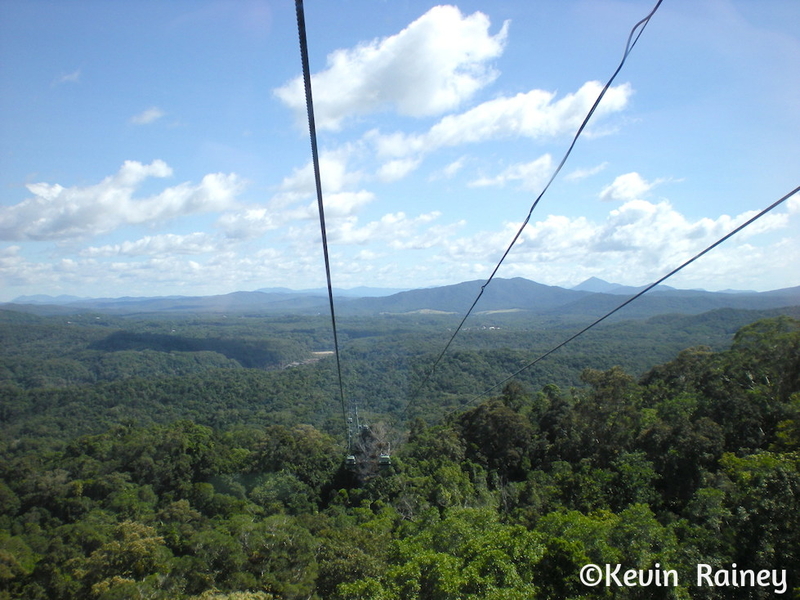 We were taking the world’s longest gondola network over the rainforests near Cairns to Kuranda park, one of Queensland’s top tourist attractions. 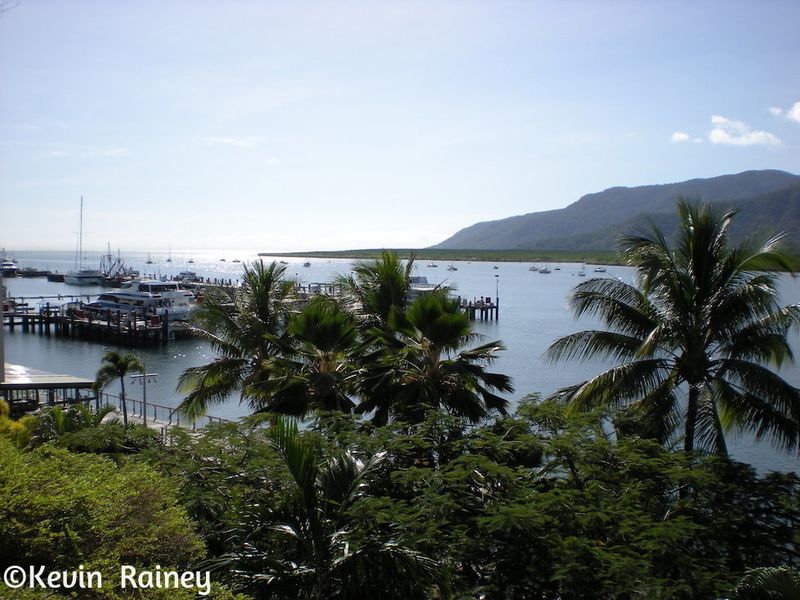 We began at the Smithfield Terminal located in the suburb of Smithfield, about 15 minutes north of Cairns, and 50 minutes south of Port Douglas. The gondola spans about 4.7 miles over Barron Gorge National Park. Along the way, the Skyrail stopped at two rainforest mid-stations. Our first stop was the Red Peak Station, the highest point of the cableway at about 1,788 feet above sea level. There we disembarked and walked several rainforest boardwalks where we about placards about the rainforest. We also visited an interpretive center that explained wildlife in the area. 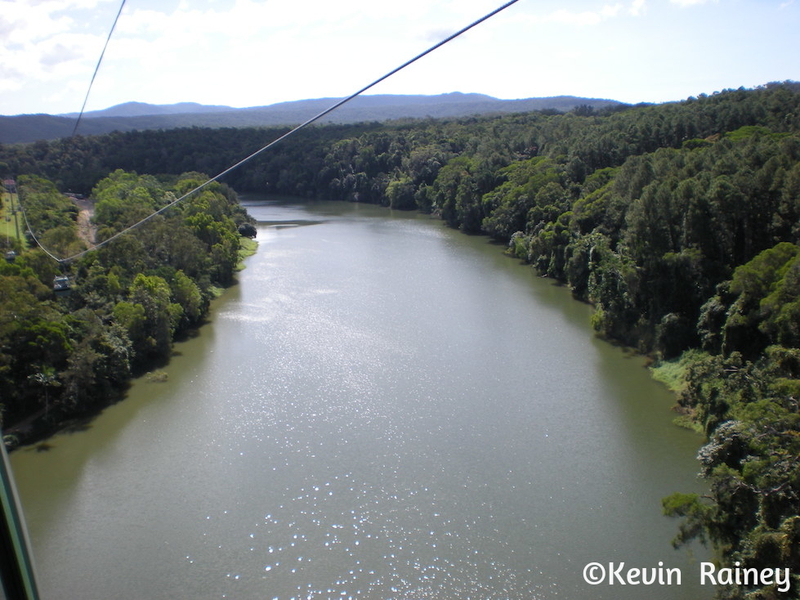 Upon re-boarding the cableway, we marveled at the huge canopy of trees below us. It was so different than a gondola over furs and bowls of snow! It wasn’t long before we arrived at Barron Falls Station. We disembarked and walked out to famous Barron Falls, considered one of the most spectacular waterfalls in Australia. We walked the boardwalks to three different lookouts. The water was down this time of the year, but the falls were still impressive. A nearby station featured a rainforest interpretation centre presented by the CSIRO (Commonwealth Scientific and Industrial Research Organisation), Australia’s national science organization. Upon re-boarding the gondola, we enjoyed views of a beautiful lake as we descended down to the final station: Kuranda Terminal. The Skyrail trip took about 1.5 hours, but it was well worth the time. The Kuranda Terminal is located in the rainforest village of Kuranda, and also adjacent to the Kuranda Scenic Railway Station. Upon arrival in the town, we grabbed a lunch of pastries and Pepsi before touring the town. 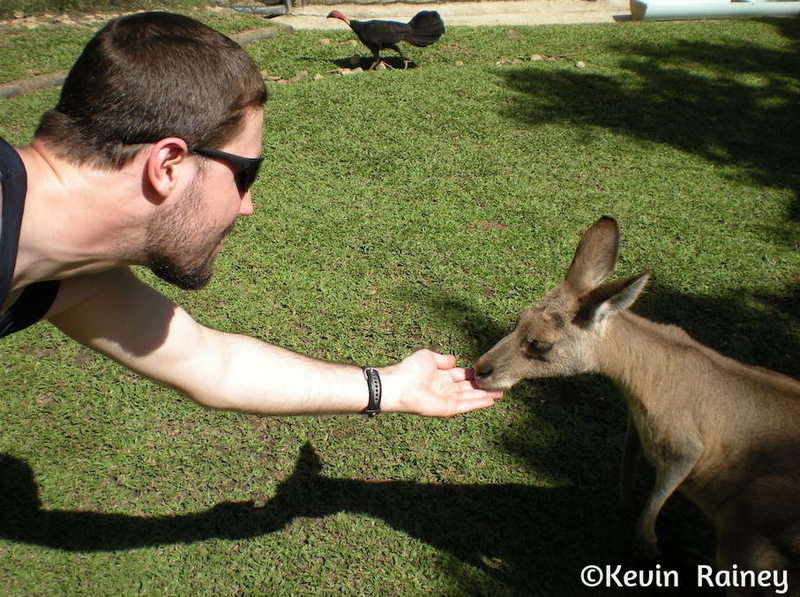 One of the main reasons people come to Kuranda is to see all of the wildlife up close. A bird aviary delights the bird watchers with an impressive display of most species of birds found in Australia. A butterfly sanctuary served as a breeding ground for some color butterflies, including some big and bright monarch butterflies. We visited a wildlife rescue and rehabilitation center where a number of marsupials such as kangaroos and wallabies were being rehabilitated due misfortunes in their lives. You could walk up and touch and feed them! One of the neatest was being able to see a rare red tree kangaroo up close. 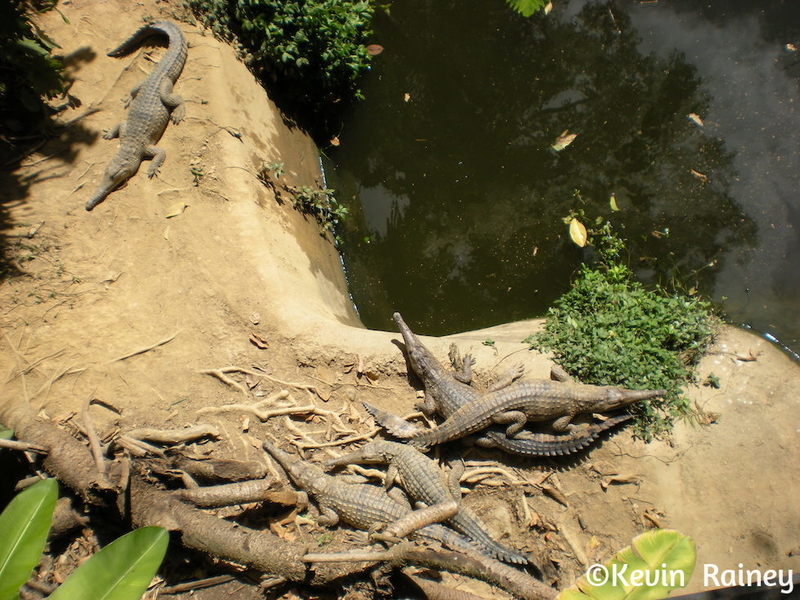 We also toured the crocodile pools where large families of crocodiles were cooling off. The nearby reptile park held huge varieties of Aussie snakes and colorful lizards/geckos. However, the highlight was visiting the Koala sanctuary. 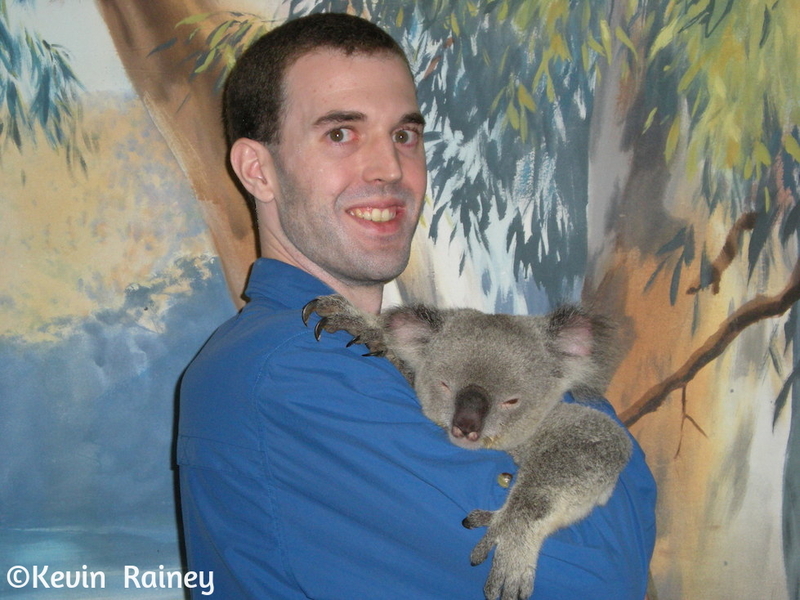 For $55 dollars, we had the opportunity to hold a koala and have our photo made with it. The koalas were practically sound asleep as they clung to us with their shape claws. We learned that koalas sleep more than 85 percent of their lives. Much of the rest of the time they eat eucalyptus leaves. 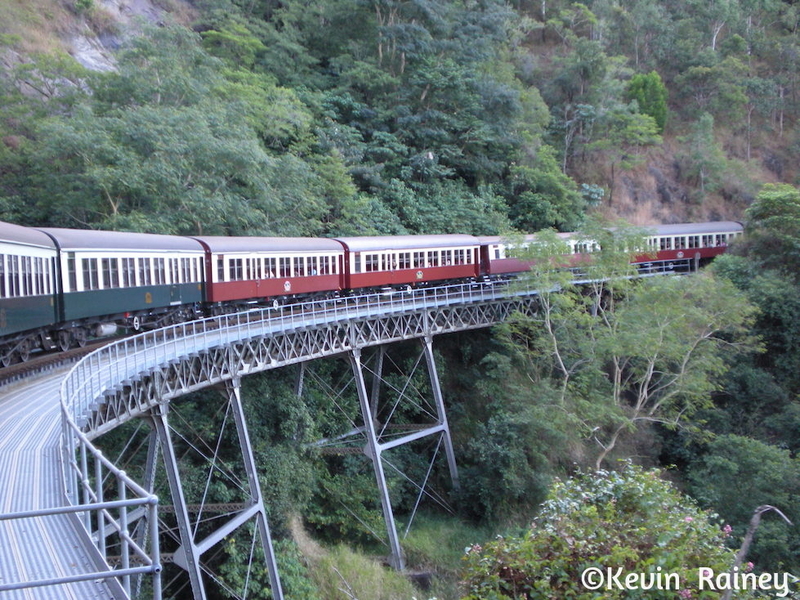 Fulfilled from our trip to Kuranda, we headed to the Kuranda Scenic Railway train station. Around 17:00, the train chugged out of the station. 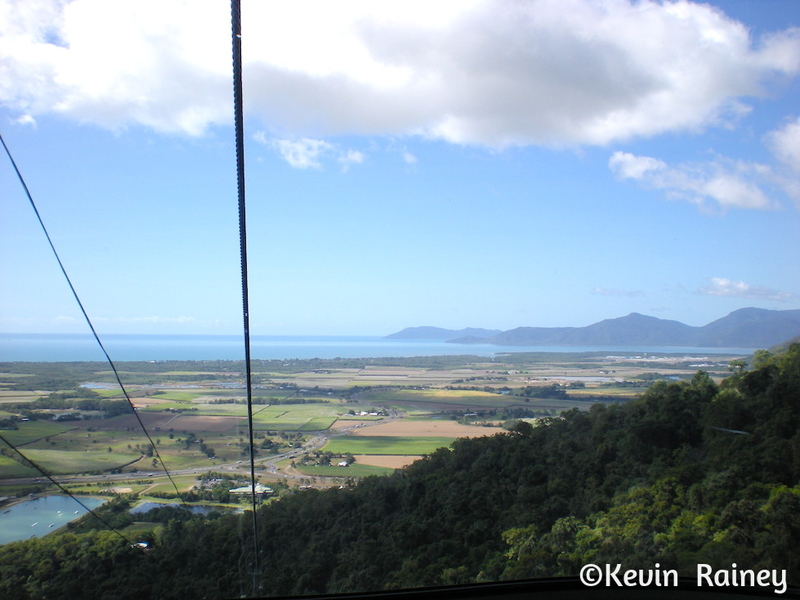 On the descent down the Macalister Range to the suburbs of Cairns, we passed spectacular scenery and traveled through 15 handmade tunnels and 37 bridges as we descended almost 1,400 feet. We enjoyed detailed commentary about the surroundings and the train’s construction. We stopped at a lookout of Barron Falls where we enjoyed a sweeping view of the falls. Along the journey we also passed the smaller but beautiful Stoney Creek Falls, which was arms-length from the train. It passes through the suburbs of Stratford, Freshwater (stopping at Freshwater Station) and Redlynch before reaching Kuranda. After about 1 hour and 45 minutes on the train, we reached the end of the 23-mile journey as we arrived in the station near Cairns. From there, a bus took us to the Cairns Hilton back in Cairns. After getting cleaned up, we walked around the docks and enjoyed a beautiful sunset. 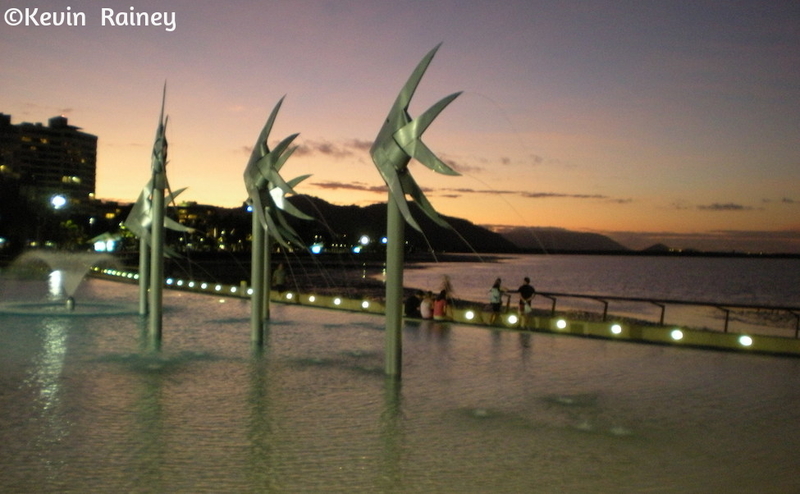 We enjoyed a great seafood dinner of fish, shrimp and scallops and then walked to see the lovely Esplanade lagoon. The lagoon is one of the largest manmade lagoons in the worlds. It exists because poisonous jelly fish populate the beaches of the coast during many months of the year. That evening we slept well after our last day in Queensland. This is such a beautiful part of Australia!